The hardest part of the soup was prepping the squash. I found it easy to microwave the squash first, let it cool slightly, then peel and cut the squash for the soup. Alternatively, you could cut and peel before you microwave it. Roasting it would be easy as well, but takes longer and you are more likely to get soft (roasted) squash. This is my submission for this month’s Monthly Mingle which is featuring Soups, hosted by Tongue Ticklers (update posted here). Once I opened the can of pumpkin puree, I started to look for other ways of using pumpkin. I love the combination of cinnamon and pumpkin, so this was a natural muffin to make. 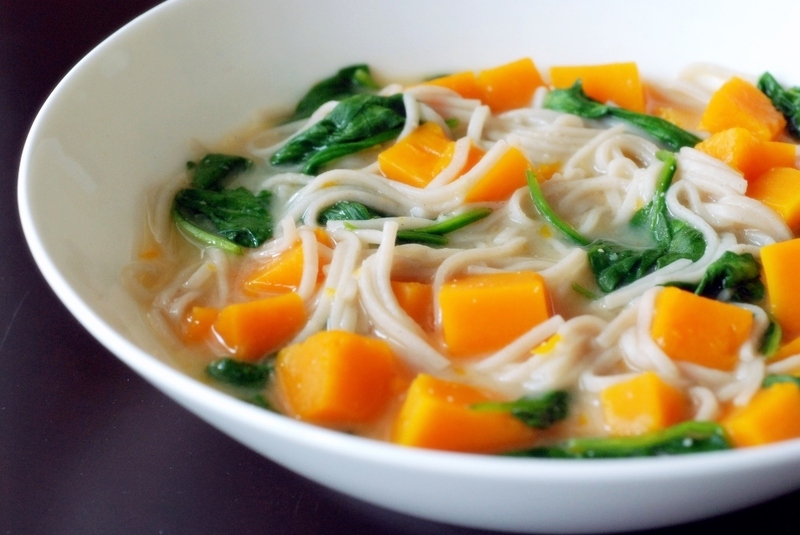 I got a few cookbooks on squash from the public library and was drawn to this recipe. I found it in Pumpkin and Squash: Recipes from Canada’s Best Chefs by Elaine Elliot and Virginia Lee. The recipe was submitted by the now-closed Jakobstettel Inn in St. Jacob’s, Ontario (which still looks like a gorgeous place for a rural retreat and close to the wonderful St Jacob’s market), who promised moist, delicious muffins. 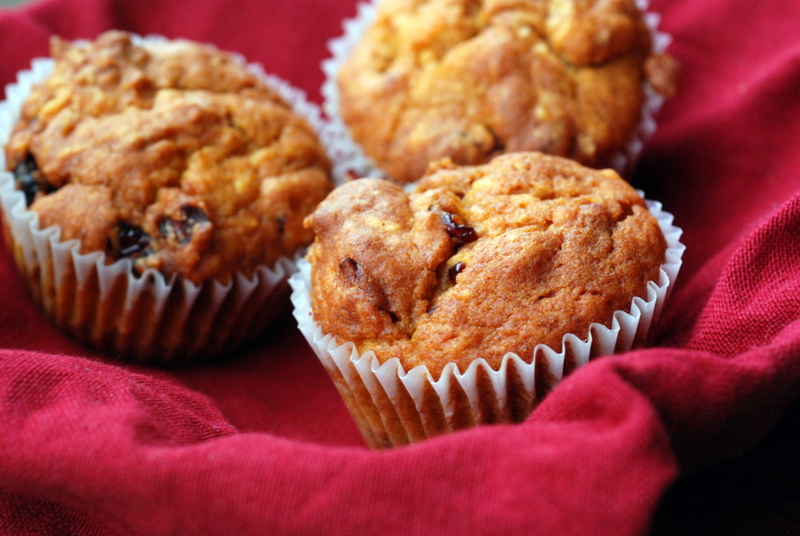 The recipe was modified to include less sugar and less oil, and it was spot-on: a flavourful, unassuming moist muffin. I had to beg my mom not to eat too many before I could take a quick photo one morning. I actually have to give credit to my mom, who made the muffins for me as a surprise after a long day at work. This weekend, we had our first Taste Space potluck where we each made a dish to share and learn more about/from each other. I am excited about how this blog will bring us together as new and old friends, with lots of yummy food! 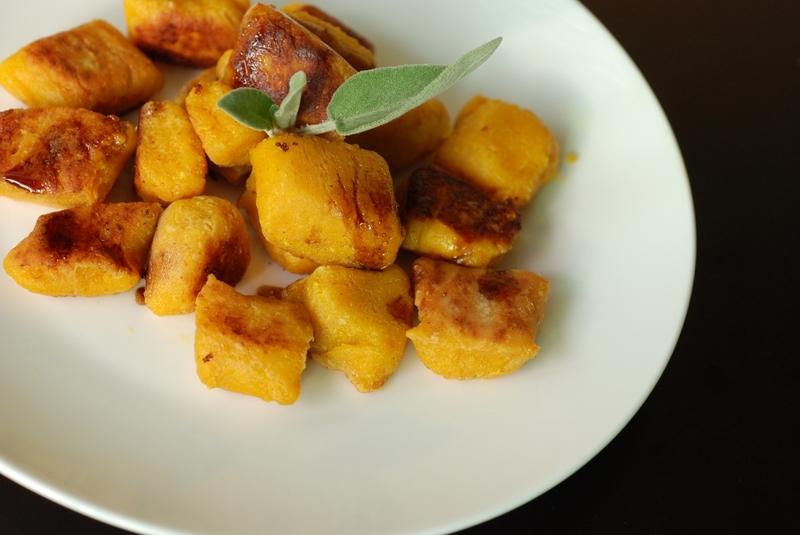 My contribution was this lovely pan-fried pumpkin gnocchi with brown butter sage, from the Steamy Kitchen. I have made her pan-fried lemon ricotta gnocchi which were simply heaven on my tongue (moist, melt in your melt soft, with a hint of lemon within a pillow-soft cheese base), so I knew they were coming from a great source and would be easy to make. Personally, I prefer the lemon ricotta gnocchi, but the pumpkin was a nice change. It has a heavy cheese taste as there is lots of ricotta and parmesan cheese within the gnocchi. In retrospect, this probably wasn’t the best dish for a potluck, as the gnocchi toughened up a bit while they were being kept warm in the oven as we took the photos (yes, I did sneak a few to make sure they were cooked all the way through). Not only was this the first time I cooked with pumpkin, it was also the first time I cooked with sage, so I am submitting this to Weekend Herb Blogging, hosted this week by Lynne (wrap-up posted here). Don’t worry, I have plenty more pumpkin recipes to come and I still have to investigate other uses for sage in the meantime. Pizza never goes out of style. In fact, it’s making somewhat of a comeback these days. What with real neapolitan pizzerias sprouting up in Toronto and Ottawa, it seems that the unbeatable idea of a crisp circle of dough covered in any choice of toppings and perhaps, some cheese, is edging back to fan favourite. 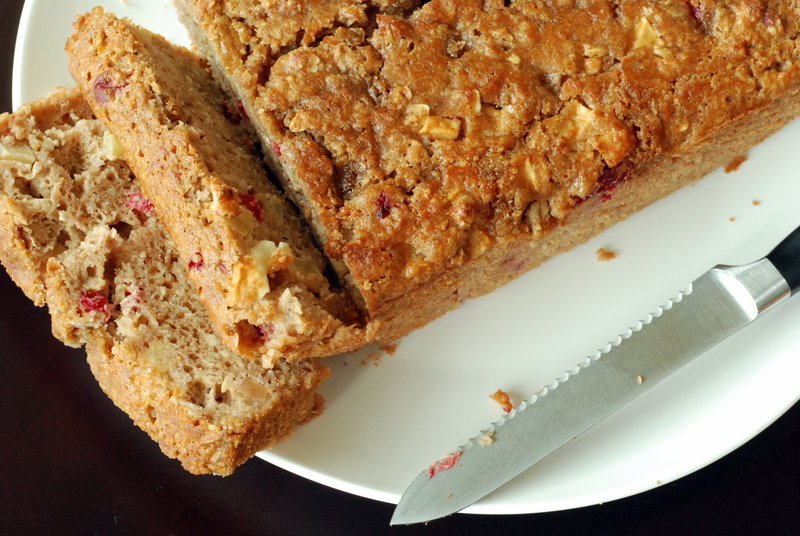 Gone are the greasy, gooey slices of heavy dough, and maybe we should be thankful for that. These restaurants are opting for wood-fired ovens imported directly from Italy to bake their creations. The result? A crust that is light but never too thin or cardboard-like because it does most of its rising right in the super hot oven (Libretto claims theirs reaches 900 degrees on their website…imagine!). The dough puffs up, sometimes makes little bubbles, but doesn’t dry out. It’s wonderful. That being said, it’s not everyday that I feel like pluncking down an average of 15$-17$ for what amounts to a medium sized pizza at any of these two haunts, especially since I found a recipe for pizza that gives rather good results. Minus the wood burning oven (hard to come by in rented apartments), I can get pretty reasonable results with a regular oven (at 450 degrees) and fairly basic ingredients. 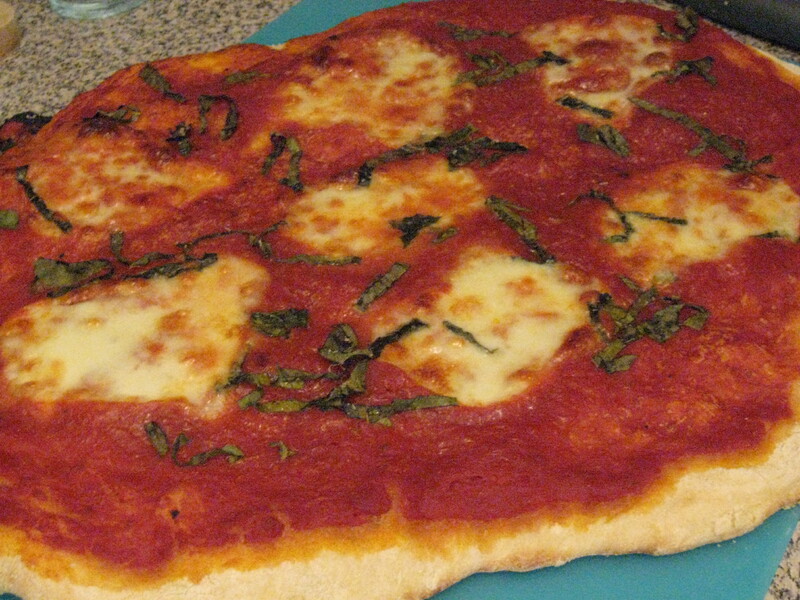 Tonight, I made the unbeatable classic, the most basic of all pizzas: Pizza Margarita. The combination of a simply seasoned tomato sauce, some fresh mozzarella (regular, not di Bufala) and some basil is a winner – and it also matches the colours of the Italian flag! The result tonight was hugely satisfying. I found the recipe last year on this site. Scroll down a bit for the dough recipe. It literally takes 15 minutes to make and you let it rest about 1 hour, then shape it, top it and bake it. The sauce was my own. I just kept it simple and used the rest of a can of puréed tomatoes (Italian) and some orange zest and pepper. The mozzarella was not very interesting – just a log of fresh that I cut in rounds. When I am melting the cheese, I don’t feel compelled to always use top of the line…unless it’s going to be the feature of the pizza. 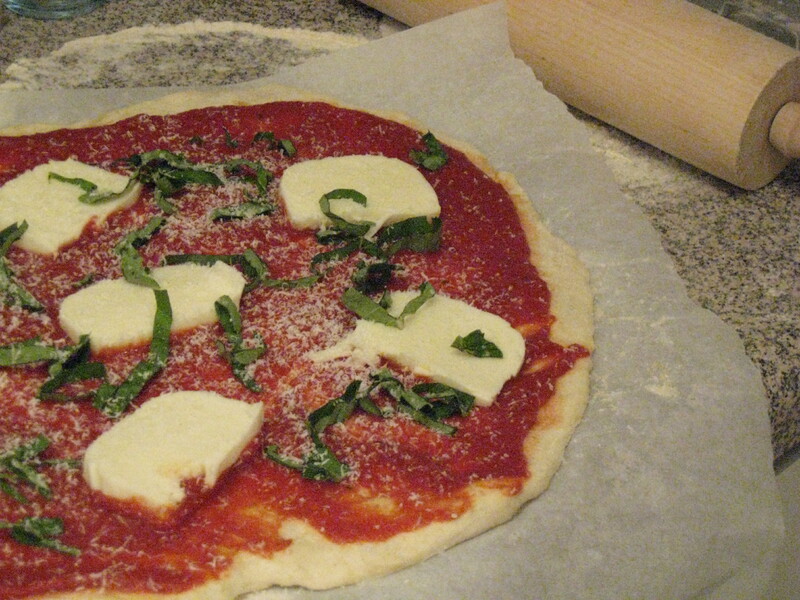 Also, there are some schools of thought who feel that Mozzarella di Bufala, which is decidedly more milky, does not belong on a pizza…I leave it up to you. I’ve done a fabulous pizza with slivered red onion, oregano and Mozzarella di Bufala, so I like it either way. I love when I discover new foods. It isn’t that I don’t know about cranberries because I love dried cranberries, but I must confess that I had never bought fresh cranberries before. I am not sure what took me so long, though, because they are delicious. They are a bit tart but cut the sweetness in whatever dish you are making. 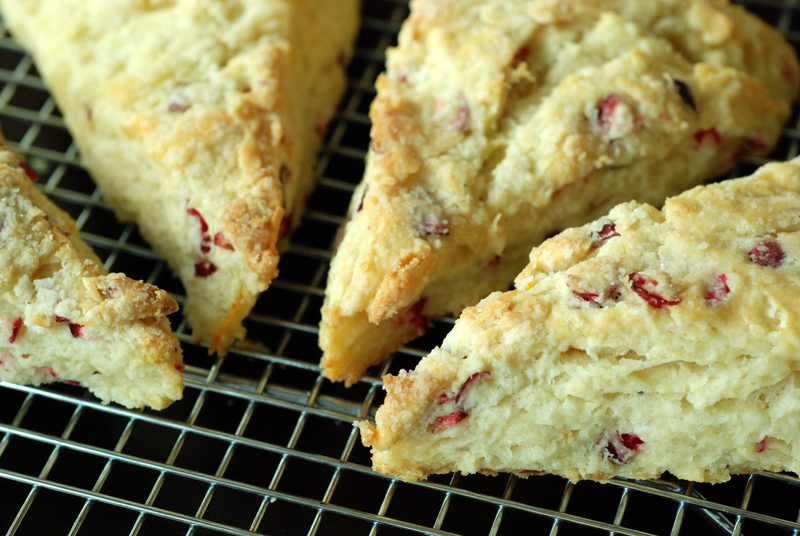 This is the first recipe with fresh cranberries that I will share. 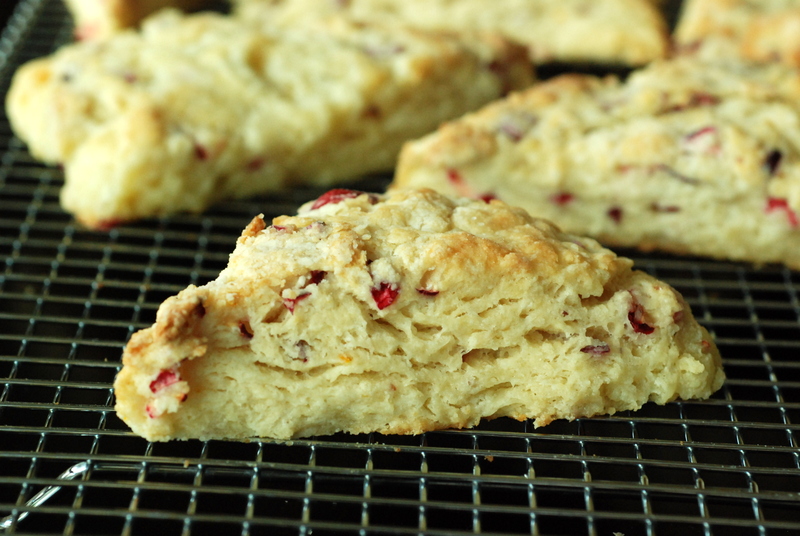 It is a nice, light scone recipe with orange and fresh cranberries. I liked how it used buttermilk instead of cream. It was adapted from Bon Appétit (November 1998) based on the comments from epicurious. 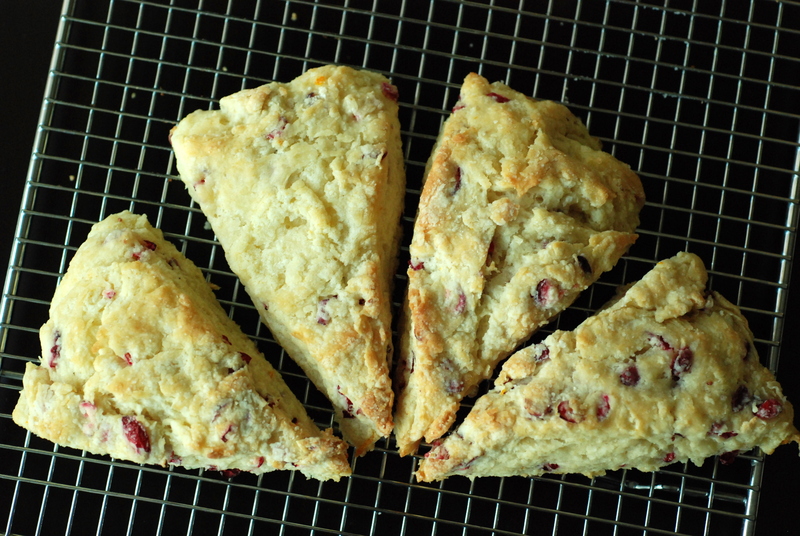 My only further tinkering would be to chop the fresh cranberries in bigger chunks to get big bursts of tartness. 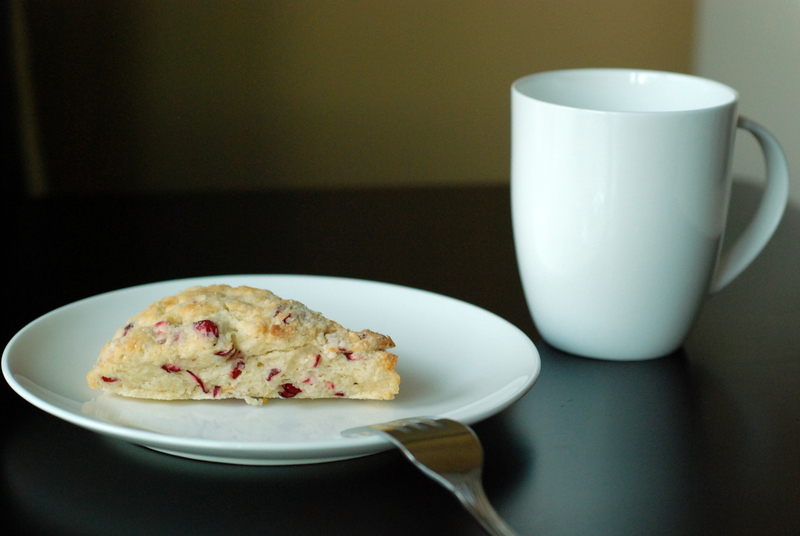 Scones are best straight from the oven, but these were still good as leftovers, if they manage to last that long. This is my entry to this week’s Weekend Herb Blogging hosted by Winnie at Healthy Green Kitchen and here is the wrap-up. Tart, pulpy, sweet — what a treat! These Niagara Cabernet Franc grapes were on sale for an unbelievable $0.99 a pound. The recipe? Wash, pluck, enjoy! Of all courses, brunch is my favourite. Possibly because I am too inpatient to make anything demanding for breakfast before my tummy rumbles.. or it could just be because it is routinely filled with fruit, eggs, cream, bacon, butter, you name it. It must be the latter… at least that is what they are teaching me at George Brown: butter is your friend. Something tells me it loves me a bit too much around the hips, though! 😉 Of course, everything is great in moderation. Pancakes are no exception.. especially when they are teamed with wild blueberries. 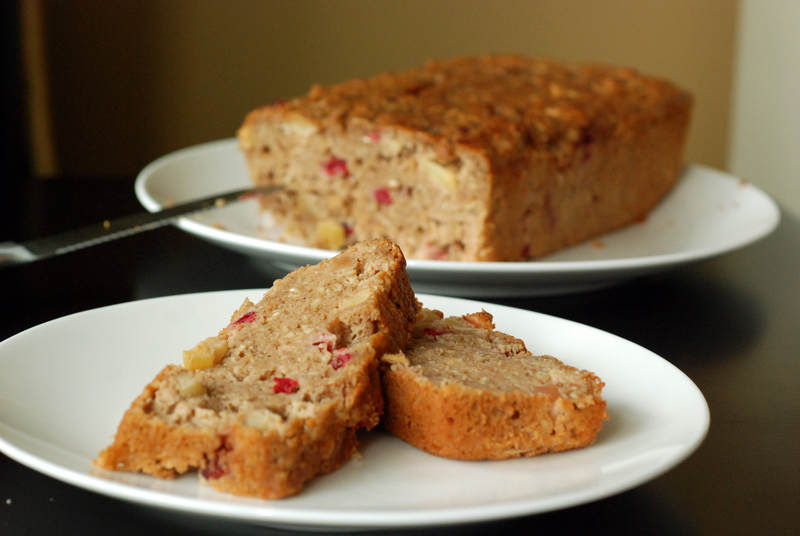 This recipe is quite simple to make and the trick is not to overmix the batter. I found that using a whisk works great to help you get around the batter without allowing one to mix to the max. The result will be light, fluffy pancakes. I couldn’t believe the height of mine! The recipe is awesome because you add the fruit straight to the frying pancake. This great because it helps to rid of the problem of blue pancakes if your blueberries bleed, but you can also make a variety of fruit/chocolate pancakes at once. 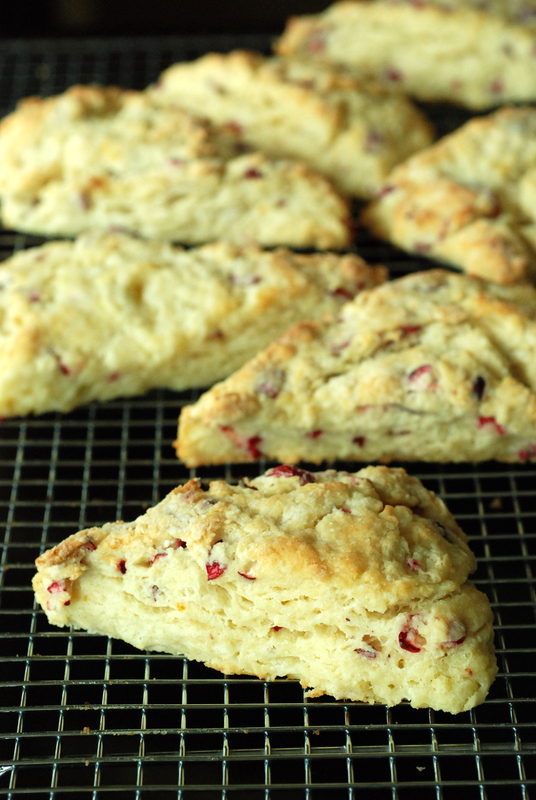 I also made a few with fresh cranberries dusted with sugar, and they were super tasty too. The original recipe comes from Mildred’s Temple Kitchen, a restaurant in Toronto, that I have been dying to try (not only do they have a fabulous brunch but lunch and dinner also get rave reviews). The recipe was originally published in Out to Brunch by Donna Dooher and Claire Stubbs and was posted by the restaurant here. My adapted version follows. I am submitting this entry to this month’s Monthly Mingle: Brunch. (update: round-up posted here). This savoury tart or quiche was inspired by the contents of the fridge crisper — a bunch of leeks and a handful of mushrooms — and proved delicious enough to please even a quiche-cynic! Pastry making is always a learning experience for me. To appease an irritable tummy, I use whole grains where possible and often have to experiment for success. A 100% whole wheat crust does not always roll properly for me, and I have been known to piece together a crust using little bits. The pastry shell recipe, adapted from Jeanne Lemlin’s Vegetable Quiche with Smoked Cheese in the Vegetarian Pleasures cookbook, uses about 60% whole wheat and works very well. The dough was easy to roll and turned out flaky and delicious. My secret: add extra butter and refold dough while rolling. And because two crusts are as easy to make as one, I doubled the recipe and froze a Broccoli and Sundried Tomato Tart for a rainy day. I was catching up with a friend last week. Of course, the conversation veered to food. 😉 She was teasing me as she described all the baked goods she had made with her new Cuisinart. This didn’t surprise me as I know she is a fabulous baker, but what shocked me was that she told me that she doesn’t make soups. WHAT?! 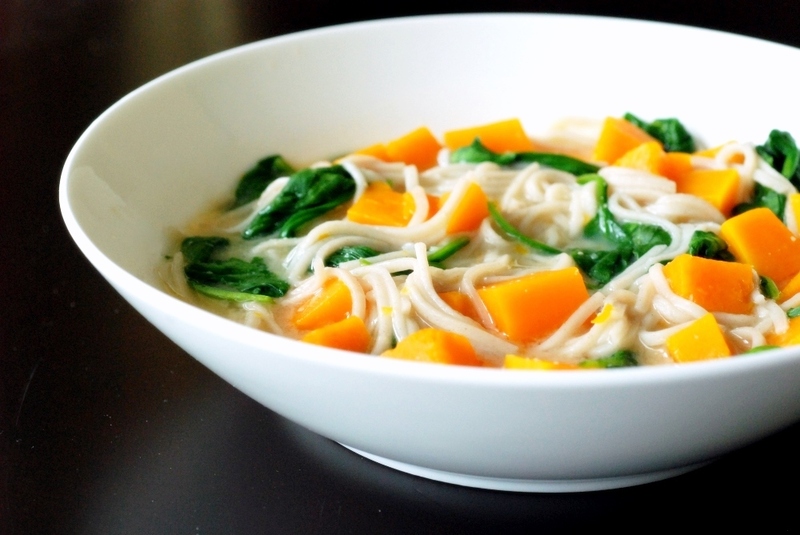 I LOVE soups! They are easy to make, difficult to screw up, very tasty and usually healthy. I will concede that I rarely make my own stock (save Japanese dashi), but that doesn’t stop me from making delicious, flavourful soups. My inspiration for the soup came from 300 Sensational Soups by Carla Snyder and Meredith Deeds. The soups are a bit heavy on the added cream, but this one piqued my interest.